Dr. Drew Dooley is a Generations Specialist and Life Mastery Consultant with a passion for people, books, red wine and dark chocolate. As a self-proclaimed Boom-Xer, Drew is fascinated by how the generations interact and believes that from the Silents to the iGen, we all play an important part in the creation of a hopeful future. With 5.5 generations currently in the marketplace — spanning over 60 years of social change, media influences, and technology shifts — Dr. Dooley strives to educate her audience on how each generation operates, thinks, and relates to the world. 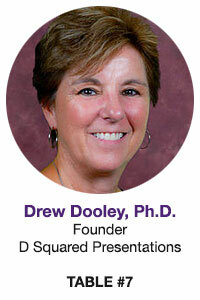 Drew holds a Doctorate in Education and Generational Studies from NM State University and has studied the nuances of generational differences and learning styles for over 15 years. Her expertise in this area has led her across the United States to speak to educators, politicians, business owners, college professors, entrepreneurs, and most recently as a keynote speaker at the National Teacher’s Conference in Las Vegas, Nevada. Dr. Dooley understands we are on the verge of an unprecedented digital and social revolution which is as confusing as it is exciting, and she is ready to guide, offer insight, and challenge her listeners to look past how things were always done and embrace the new world unfolding before us. Drew will be leading the educational roundtable, Navigating the Generational Waters in the Workplace, at Table #7.